In a span of three days, all hell broke loose again! I just can’t imagine how hellish life can be. After that shot on the spot incident, I got into another trying moment. My baby boy got a severe asthma attack that caused him to be hospitalized for two days! Last Monday night, he was having a hard time sleeping. Since I am not a fully experienced mom, I have no idea what was happening. On the next day, my hubby didn’t go to work. He stayed with us. Around late afternoon when the money I borrowed from my online friend was converted to pesos, we went to the clinic to get his health stats checked up. Then it was there that we found out that he was already having a severe asthma attack. He was rushed to the emergency room and was supplemented with a breathing apparatus to help him breath. Then afterwards, he was nebulized together with the oxygen supplement to augment his breathing. When all these things were happening, I was crying ever now and then. Every time I see those plastic tubes at my baby’s face, I felt utterly stupid and so useless! I felt that I was not being a good mom. I really failed!! I felt so depressed that I was not able to be the best mom at that time. why such panic? is this ur very first time to have ur son attacked by that dreaded asthma? if it is, then i understand.. but don’t consider urself the worst mommy dear. of course u’r not.. the care and concern u’v expressed don’t make you one. as long as hospitals and the nebulizer thing are accessible, things will be taken good care of. i hope ur son gets better the soonest. Don’t feel like that because you are not a failure. Your son is still alive and you were there for him. I’m sure he or your family won’t think you are. Don’t entertain such thoughts, you are doing your best and that’s all that matters. God will always be there when you call on him. Hello mommy ruby!Don’t be hard on yourself.Your not a failure mom.You are doing your best to take good care of children.To love and give the best for them. I know as soon as possible your son will be okay. God bless! hi mommy rubs, get well soon to your lil boy. hpe he is better now. i’ve never experience that asthma attack in any of my kids bt lots of my mom friends did. their best buddy in times like that is nebulizer. bili ka nalang nyan and u don’t have to run to the ER everytime it attacks. and let ur boy tell you that he is not well when he can’t breath para ma warn ka. take care and happy week-end! mommy ruby! i know where you’re coming from. I’ve been there, too. my son spent his first Christmas and New Year in the hospital! it’s hard not to feel down. please be strong for your boy. he needs you more than anyone else. how can you give him the best care if you’re at your lowest? if you think you could have done a lot better, stop blaming yourself. it won’t help right now. it’s more important to heed the lessons learned. i hope and pray your boy gets well the soonest possible time. take care of yourself din ha! Don't blame yourself, has got nothing to do with you or whoever, it happens to all kids… bsta just hang on, he'll be alright! Mommy R you are not a failure and it is not your fault so please don’t blame yourself. If this is your first, that is to be expected. After the initial scare of asthma and when your baby boy gets better and is home na, read more about asthma and what triggers it para next time you and your son can catch it earlier para ma avoid na ang ER scares. I was wondering why you there were no new posts in your blog kaya pala your baby got sick. I know this is really a trying time but don’t blame yourself I’m sure we moms think we’re the worst at one point or another but the good thing is our children don’t think that way. I’m sure just seeing you there by his side makes will make him strong and healthy in no time. dont be too hard on yourself. our failure to diagnose a sickness at once can not be attributed to us as “bad moms”. my daughter also underwent the same. she coughed the whole night and we went to the doctor the next day, doc told us she was having asthma attack already. good thing that the meds given and the nebulizer did wonders. no need for her to be admitted. i know when our kids are sick, we tend to blame ourselves and wonder if we could have prevented the sickness, but there are things that God allow to happen… all for His glory. Just keep praying for wisdom and guidance to the Lord. Im sure He will answer your heart’s questions. as for your baby, just make sure you have a nebulizer at home. 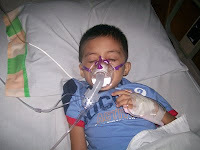 since he has been diagnosed to have asthma, it is best to be prepared with a nebulizer at home. in our case, we are supplementing our kids with maintenance to avoid asthma attacks especially during cold season, like now. hang on mommy! Jesus is there for you!